Chief of General Staff Gen. Hulusi Akar vowed Monday to defeat all terrorists in Afrin, northwestern Syria as the Turkish-led operation there entered its 37th day. "The terrorists in Afrin, and those brought there from outside regardless of their origins, along with the external forces who back them, will be completely routed," Akar said during a visit to the southern Turkish province of Hatay, close to Syria's border. 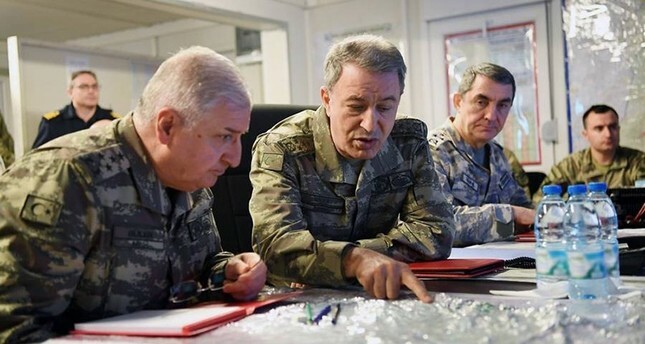 Akar, accompanied by the commanders of the Turkish Land and Air Forces, Generals Yaşar Güler and Hasan Küçükakyüz, was in Hatay to inspect military units, outposts, command posts, and mobile military hospitals, according to a Turkish General Staff statement. The Turkish border cities of Kilis and Hatay are within firing range of the YPG/PKK terrorist group from Syria's Afrin. Since the start of Operation Olive Branch, the YPG/PKK has targeted civilians in Turkey with some 100 cross-border attacks, leading to seven civilian deaths and 125 wounded. Operation Olive Branch was launched by Turkey on Jan. 20 to remove the PKK and its affiliate the Democratic Union Party (PYD) and its armed wing the People's Protection Units (YPG), as well as Daesh terrorists from Afrin in northwestern Syria. The operation in Afrin – bordering Turkey's Hatay and Kilis provinces – was widely expected in the wake of Operation Euphrates Shield in northern Syria, which cleared Daesh terrorists from Turkey's border between Aug. 24, 2016 and March 2017. Afrin has been a major hideout for the PKK/PYD/YPG since July 2012 when the Assad regime in Syria left the city to the terrorist group without putting up a fight.